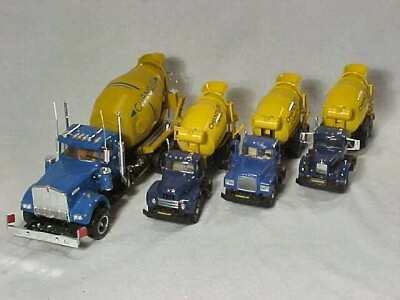 From all different sources, this is a group of mixers and a form truck that I had made with the Chandler logo. I drove from Massachusettes to Pennsylvania on the day after Thanksgiving in 1996 to pick up a mixer I had ordered. The builders thought too much of it to subject it to shipping. 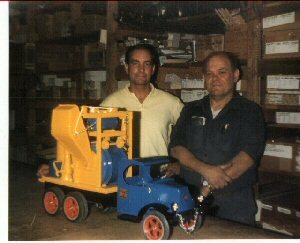 Here I am, the proud new owner taking delivery of a custom built Mack mixer at Buddy K Toys. 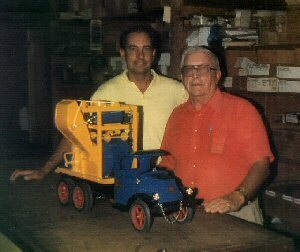 Owner Bud Krouse is pictured here with me on the left and Butch Buss, custom builder for Buddy K Toys is here on the right. 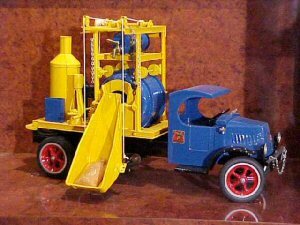 It was a great visit with Bud and Butch, and a thrill to see Bud's collection of rare and custom Buddy L toys, but this truck that they made for me is one of my favorites. and here she is at home in my collection. 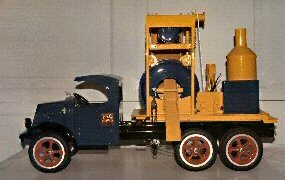 The mixer is a 1920's Buddy L with modified parts, custom chainfall, and an extended chute by Butch to accurately replicate a truck of the era. Real Macks didn't have the bulldog mascots until the 30's, but I decided to put one on anyway. 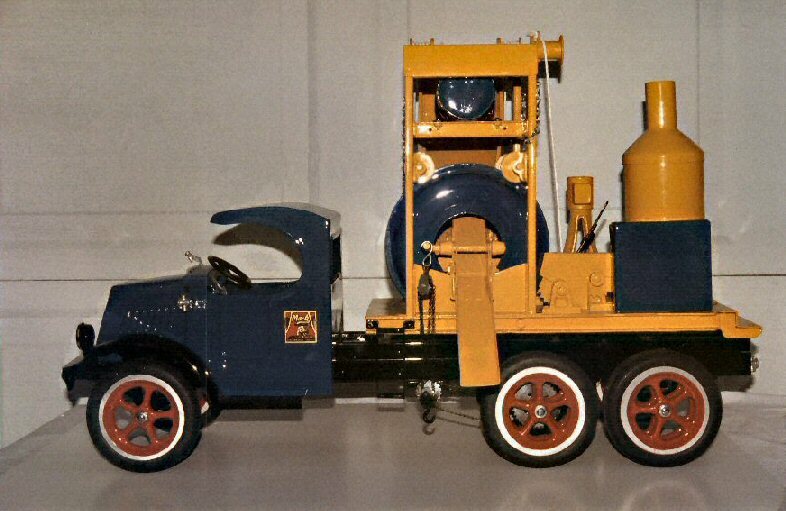 The truck was built before e-mail was available to me so mostly we communicated through snail mail and the telephone. I also have some pictures of the ordering and building process,color samples and a trial fit of the proposed parts. 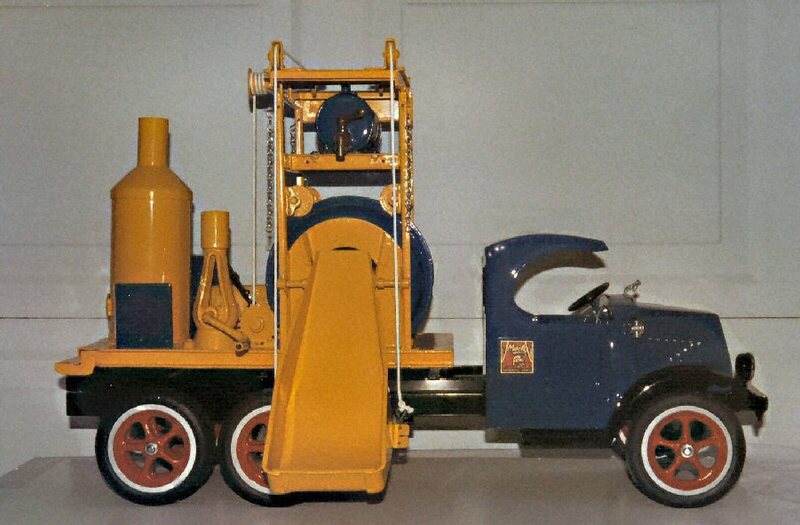 It was similar to when I ordered a real Mack DM in 1980, in that I had to spec out all my options. The colors are exactly the ones I used on my real trucks.